St. Rose of Lima Parish was founded by the Very Reverend John I. Hallern on June 23, 1907, as a mission of St. Patrick's York. The first Church, which was purchased from St. Matthew's Lutheran Congregation, was blessed and dedicated on September 3, 1907 at 31 Carlisle Avenue, with Reverend Thomas F.X. Dougherty as the first pastor. On May 23, 1915, the cornerstone was laid for a new church, classrooms and social hall in what is now the Parish Center. This building was dedicated on December 19, 1915, and the following year, the Carlisle Avenue church was sold. Three years later, the house adjoining the Church was purchased for a convent. On Friday, August 28, 1919, five Sisters of Saint Joseph arrived to open the first St. Rose of Lima School, which occurred on September 8th. Within one week 82 students were enrolled. 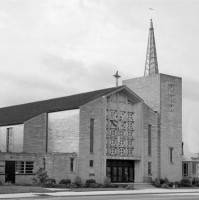 The cornerstone for the present church was laid on March 10, 1957 and on December 1, 1957, a silver jubilee and dedication mass were celebrated. Three years later, a new convent was dedicated and then completed on 1967, serving as a symbol of the commitment to Catholic education as it was built solely for the purpose of housing sisters from the teaching order of St. Joseph's. The Mosaic of St. Rose of Lima in back of the main alter was purchased and dedicated by the people of the Parish as a lasting memorial to Father Henry J. Howarth, the fourth pastor of St. Rose of Lima Church. It is a reproduction of an ancient 18th century picture of St. Rose.